F This Movie Fest 7 to Celebrate 1989 Films The ’Burbs, Road House, Batman, and More! Ray Tango: Why just use your Plan A? Gabriel Cash: Because it's a hell of a lot better than your Plan B, which you don't even have. Q: How did Perret get inside the prison? Q: What's the name of the song that Katherine is dancing to at the club? Tango is a smooth cop who dresses like a banker, deals in stocks and shares but loves the action. Cash is a rough and ready action man who lives life fast and dirty but is a better cop for it. Each man serves on opposite sides of the LA and both are thorns in the side of crime kingpin Yves Perret  accountable for losing him millions in seized drugs and weapons. Rather than just have them killed, Perret sets them both up for the murder of an undercover cop supposedly in a sting operation. With all the evidence against them they cop a plea for minimum-security sentence  which they don't get. 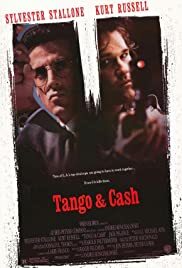 With a violent and angry welcome for them, Tango and Cash decide they need to escape soon or be carried out  plus, bringing down Perret is now their sole focus. Although I know just what this film was going to be like, I thought I'd try to give it a chance and watch it again with a fresh pair of eyes. Nothing about the plot summary would lead you to expect anything other than a clichéd action movie and all that comes with it. And that is almost exactly what you get with this. The plot is predictable and really you are just watching it go through the motions and do just what you expect it to at almost every stage. The action is typically over-the-top and lacking the touch of realism that is usually needed to make it really engaging and exciting  instead it is noisy and overblown, managing to be quite fun but certainly not gripping or involving. The character dynamics are also clichéd  it is love/hate, bantering, mismatched cops stuff but ironically it actually works pretty well. The main reason for this is that the script shows that at least Feldman wasn't taking it too seriously  the dialogue allows both to mock each other and stops them settling into their macho images too much. Happily both Stallone and Russell buy into it and let themselves be made fun of as much as they get to give it. Neither are brilliant but at least they seem to have got the joke and avoid playing it too straight or just going along with the macho clichés. Of course they eventually get back to basics and (along with the film) eventually just gets down to big bangs and action movie traditions but for the majority of the film they just about do enough to make it fun  albeit fun in a silly, rather guilty way. Hatcher doesn't add a great deal but it is interesting to see how good she looked then and how well she has aged in the past 15 or so years. Palance hams it up something awful and is a little painful to watch  but he is matched by equally poor bad guys from James, Hong and a few others. Pollard does his usual stuff and is typical comic relief. Overall this is a dumb action movie and if you hate that type of film then you will hate this. I must admit that, by the end, the sheer cheesy stupidity of the whole thing had started to grate on me somewhat but up till that point it had been silly and quite fun. The amusing banter is one plus and at least Stallone and Russell aren't taking it too seriously for the most part and provide enough to stop it being a totally predictable genre film  even if it is a close run thing.